The engine block is where your build begins. Precisely machined dimensions are necessary in order to achieve critical clearances on main journals, engine decks and cylinder bores. 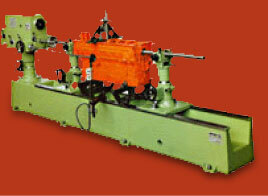 Eastwoods Auto Machine offers complete engine block machining services. An engine's level of performance is directly related to the cylinder head(s). Newer cylinder heads demand a greater degree of technical expertise and better machining methods and materials now allow older heads to be restored to "better-than-new" condition. Eastwoods Auto Machine offers complete cylinder head services. The rotating assembly is made up of the crankshaft, connecting rods and pistons and is responsible for the production of the engine's power. It's performance and reliability are dependent on precision machine work and meticulous assembly. Eastwoods Auto Machine offers complete rotating assembly services. It's the "other" shop services that sets Eastwoods apart and makes us a better and more complete choice for the customer. A part that has been machined in our shop can be installed with the confidence that it will perform reliably for many years to come.